Tobin J.M. Richardson serves as President and CEO of the zigbee alliance, leading the alliance’s efforts to develop and promote world-leading open, global standards for the Internet of Things. In this role, he works closely with the alliance Board of Directors to set strategy and to advance the adoption of zigbee standards around the globe. Tobin has two decades of experience in executive leadership, strategy and development for technology firms and organizations. His experience spans large-scale technology implementations, new service and product rollouts, and transformational change in Fortune 500 companies and world-leading firms. He currently serves in a number of industry leadership roles, including Co-Chair of NAESB’s Energy Usage Information standard committee, and participates actively on NEMA’s Smart Grid Task Force and the CEA’s Smart Grid Working Group. He holds a Master’s degree from Georgetown University, and a Bachelor’s degree from the University of California, Davis. Is a universal application language for the IoT. Richardson: We are really excited about dotdot. dotdot is the name and program which expands the common language already at the heart of zigbee devices, to enable the entire Internet of Things (IoT). It is a universal application language for the IoT. As IoT devices have proliferated, the industry has recognized that the key to adoption and creating value is a common language between devices, irrespective of the networking technology they are using. dotdot is that language — it is NOT another new standard, but rather an extension and expansion of a mature and existing standard, supported by a global ecosystem of suppliers, experts, and product vendors, combined with an interoperability mark and program now branded as dotdot. We announced this new initiative at CES 2017. Sinclair: Why does the IoT market need dotdot? Richardson: dotdot is solving an industry-wide problem for product developers, integrators, builders, and consumers. Most IoT devices don’t speak the same wireless language even if they use the same wireless technology. The result is an Internet of Things that is often a patchwork of translations – and often a frustrating experience for the integrator, building manager or consumer. The solution is a common language between all IoT devices on any wireless network, giving product developers a common platform to innovate on, and facility managers and consumers the freedom to choose products that work for them. Today’s zigbee-based devices speak a common language. With dotdot, that language – the application layer that’s already part of zigbee technology – can be applied across other IoT networks so smart devices can easily connect and work with each other for a more meaningful user experience. While other organizations are addressing this challenge with new protocols still being drafted – or single-vendor solutions – dotdot is an open, mature technology supported by the zigbee alliance’s 400+ strong global membership and a diverse supply chain. This offers developers flexibility and speed in building their products and business today – and will make the ‘smart’ interactions work for everyone as every day, connected objects will speak to each other effortlessly across any wireless network running in the home, intelligent building or neighborhood. And, in fact, that extends to wired networks too – anything that is IP-based. Sinclair: How and when will it be rolled out to IoT companies? Richardson: As 2017 progresses, the alliance will announce additional details of the dotdot program and related timing for events. However, no one needs to wait to get started as IoT companies that are active zigbee alliance members currently have access to the early versions of the dotdot specifications. This has already allowed these companies with existing zigbee products to easily create new prototypes of those same products that will leverage dotdot over other networks. With the goal of enabling IoT companies to start certifying dotdot products during the latter part of 2017, the alliance will be heavily focused on finalizing and providing the necessary program details as early in 2017 as possible. Sinclair: Can I use zigbee without dotdot? Richardson: Since a version of dotdot is already natively running on zigbee networks, zigbee devices naturally provide the same value by speaking a common application language regardless of the manufacturer they come from. 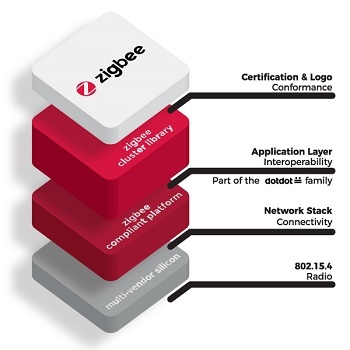 The only logo necessary in this zigbee-only environment is the zigbee logo, which is already available today. When dotdot is formally launched, manufacturers will also be able to certify zigbee devices as dotdot devices and add the dotdot logo alongside the existing zigbee logo. Together, these logos represent connectivity and interoperability – which means that these zigbee-connected devices can also interoperate with dotdot devices running on other network technologies. Sinclair: What are the other priorities for the alliance in 2017? Richardson: In terms of application language support, the alliance priority is certainly placed on launching dotdot and enabling current dotdot target markets including Smart Home and Smart Building. Of course, the continued rollout of the latest version of zigbee is a key part of that effort since it already uses dotdot natively. In addition, there will be work to enable better future application support for other alliance target markets such as smart cities and energy management. For network connectivity, the alliance has a number of active programs including the roll out of its NAN (neighborhood area network) offering, branded jupiterMesh. Further, the alliance is actively supporting improvements and derivatives of the Smart Energy networking stack that include an 868 MHz version we will launch this year that’s specifically targeted for the Smart Metering market in Great Britain. You may have noticed that we recently rolled out new branding for the alliance and across all our current technologies (and new ones such as dotdot). This new identity highlights the zigbee alliance as the foundation of the IoT, with a family of solutions that work for and together across key markets.